The Iberian plate is located on the Western Edge of the larger Eurasian plate. It not only encompasses the Iberian peninsula but also the islands and areas surrounding Corsica, Sardinia and parts of the Alps (B. Le Bayon 2006). The plates location is between the European plate to the north, and the African Plate to the South and East. The plate is moving at about 26mm/yr to the NorthEast(NASAgeodata). The Iberian Peninsula contains huge range of rocks from every age between the Ediacaran and now, with nearly all types of rock represented represented. The North Part of the Iberian peninsula forms a natural barrier that is the Pyrenees mountains. With the sediments for these mountain chains being deposited mainly during the Mesozoic (B. Andeweg 2002). They were formed as the Iberian plate slammed into the European plate as Part of it was subducted. The Cantabrian zone to west of the Pyrenees mainly consists of Carboniferous and paleozoic unmetamorphosed rocks, it was formed through the process of several thrust units(Aramo,Ponga, and Picos de Europa) that created the structure of the region. The western Asturian Leonese zone has rocks that were mainly formed during the Cambrian and Ordovician in a subsiding trough. Later deposits that were subducted are typically of the greenschist facies. There are also a small amount of volacanoes present along the Mediterranean margin that were formed due to lithospheric thinning. The volcanos range from 1 to 8 Ma (Verges et al. 2006). Approximately 100Ma during the Cretaceous present day Spain(Iberian Plate) collided with France(European Plate) and formed the Pyrenees mountain range. The plate has been moving as a consequence of the central Atlantic rift since the Upper Jurassic during the breakup of Pangaea (B.Andeweg 2002). This caused the Bay of Biscay to begin to form as well as the Biscay Abyssal Plain to form(B.Andeweg 2002). However during the cretaceous the mid-Atlantic started to open and the Biscay became a failed rift (B.Andeweg 2002). Fig. 3 Formation and movement of Iberia with relation to Europe. Along with development of Bay of Biscay. From 170 Ma to 120 Ma almost 200km of left lateral slip occurred between Europe and Iberia as the rift occurred (G. Rosenbaum et al. 2002). Then from 120 to 83Ma 115 km of convergence occured with the Sardinia region. Then Convergence with Europe until now with a small right lateral slip event in the Eocene (G. Rosenbaum et al. 2002). In the Pyrenees Earthquakes have been known to occur up to approximately magnitude 6. However this is a relatively safe area in the world to live in terms of tectonic activity. In terms of deposits Iberia is quite rich as the Iberian Pyrite Belt which holds volcanic hosted massive sulfide is quite prosperous for the region ,also worlds richest mercury deposit is found in Spain. 1. Casas-Sainz, A. M., & de Vicente, G. (2009). 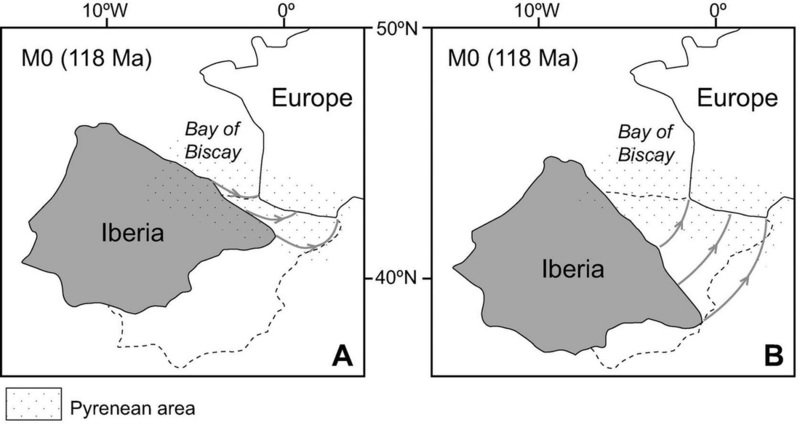 On the tectonic origin of iberian topography. Tectonophysics, 474(1-2), 214-235. 2. Benjamin Le Bayon, Michel Ballèvre, Deformation history of a subducted continental crust (Gran Paradiso, Western Alps): continuing crustal shortening during exhumation, Journal of Structural Geology, Volume 28, Issue 5, May 2006, Pages 793-815, ISSN 0191-8141, http://dx.doi.org/10.1016/j.jsg.2006.02.009. 3. Andeweg, Bernd (2002). Cenozoic tectonic evolution of the Iberian Peninsula, causes and effects of changing stress fields (PhD Thesis). 4. Allen, M. B., Kheirkhah, M., Emami, M. H., & Jones, S. J. (2011). Right-lateral shear across iran and kinematic change in the arabia-eurasia collision zone. Geophysical Journal International, 184(2), 555-574. 5. Agard, P., Omrani, J., Jolivet, L., Whitechurch, H., Vrielynck, B., Spakman, W., . . . Wortel, R. (2011). Zagros orogeny: A subduction-dominated process. Geological Magazine, 148(5-6), 692-725.